Something about the coast just makes the world slow down. Agendas and set schedules are blown away with the ocean breeze and you just relax and go with the flow. Growing up in Utah I never spent a ton of time at the beach as kid. Walking along the waters edge in my galoshes with the pups, picking up sand dollars, and looking out at the horizon brings a sense of calm. Our weekends are usually jam packed with activities and driving from one adventure to the next so when Astoria Warrenton Area Chamber of Commerce reached out to see if I was interested in coming for a visit I jumped at the offer. It was our first time visiting Astoria and we arrived with no set plans besides relaxing and breathing in some fresh ocean air. Astoria Warrenton Area Chamber of Commerce set us up with a lovely cabin at the Astoria KOA. The KOA was conveniently located directly across the street from one of the entrances to Fort Stevens State Park. It was my first time staying at a KOA and I was pleasantly surprised at how nice it was. Our cabin could have slept 6 and was well equipped with a full kitchen and bath, a bbq, and a fire pit. The KOA is a great option for families or for people that prefer a little more amenities with their outdoor adventures. Astoria is a port city and Oregon's oldest Euro-American settlement. Between Fort Stevens State Park and downtown Astoria there is a good deal of history to explore. With only 2 whole days in Astoria we couldn't do as much as we wanted but that just means we have things to add to our list for our next visit! Our low key trip was filled with fresh seafood and local brews, sunny blue skies, and a mellow change of pace. 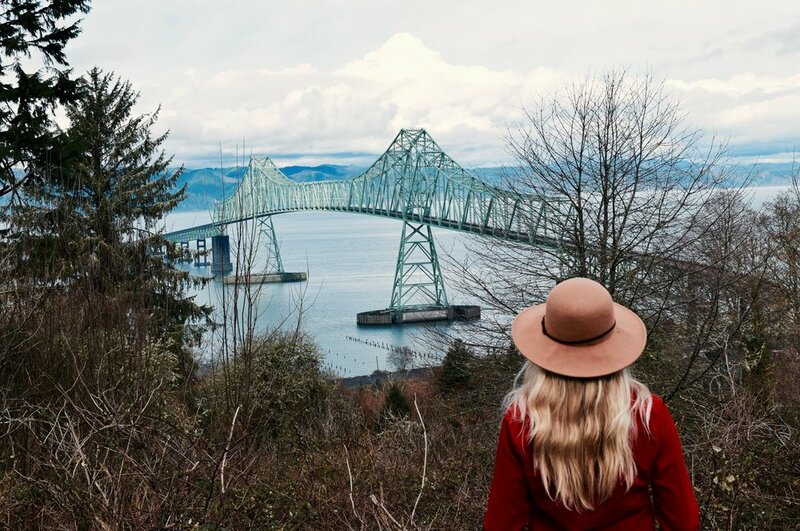 Astoria isn't just another sleepy coastal town, there's plenty to do and see and the locals are always offering kind suggestions and smiles. Below are my favorites from our trip to Astoria. 1. 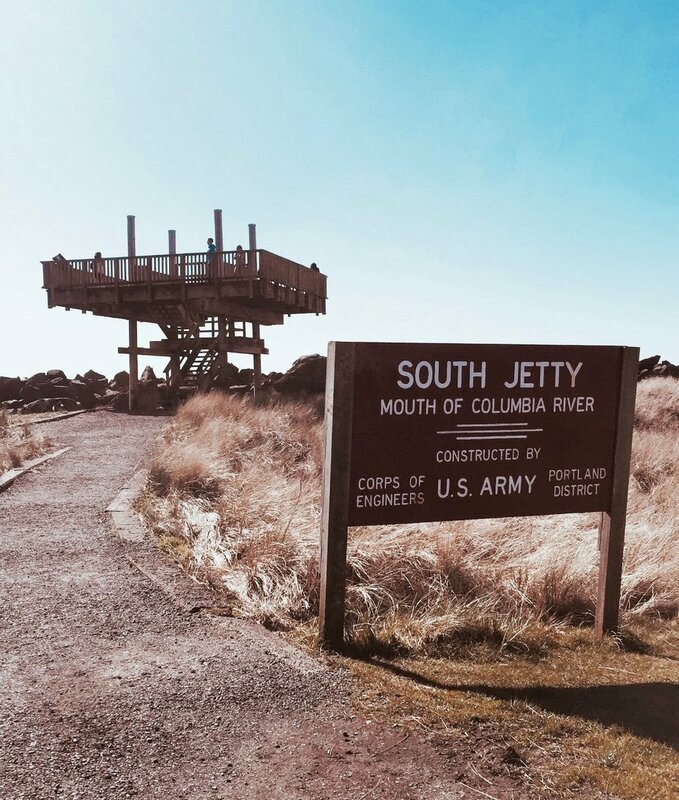 Explore the beaches and historic military forts at Fort Stevens State Park. 3. Walk up to the Astoria Column for sunset with a picnic. 4. Eat lunch at the Bowpicker, where you will have the best fish & chips of your life. 5. Go zip lining through mossy trees and over a gorgeous deep green lake at High Life Adventures. 6. Get a beer flight and fresh oysters at Buoy Beer, where you can check in on sleeping sea lions through a glass floor. 7. Walk or bike along the Astoria Riverwalk and marvel at the size of the Astoria-Megler Bridge. 8. Hop on the restored Astoria Riverfront Trolley and learn about the history of Astoria from one of the volunteer conductors. 9. Walk up to Flavel House and snap a photo of the historic house built in 1884. 10. Eat and drink at Fort George Brewing. Top Right: The Astoria Column at sunset. Above: Flavel House Museum and the ship anchor statue outside of the Columbia River Maritime Museum.